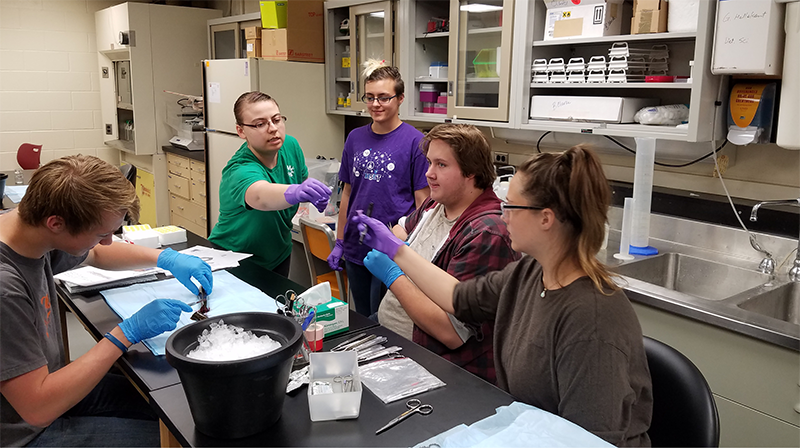 The Bridges to the Baccalaureate Program aims to increase the number of community college students entering the biomedical science field who obtain a biomedical/biobehavioral science-related baccalaureate degree. These degrees include the following: biology, chemistry, mathematics, physics, psychology, chemical engineering, and computer science. The program includes skills development and training to facilitate a seamless transfer from the community college to the University. Once students have entered the program, they will enter a summer research academy, which stresses the development of professional skills such as communication, critical thinking, and quantitative analysis. The initial research training starts in the summer research academy and develops skills of leadership, observation and data collection, and how to use the scientific method. Trainees will then progress into faculty-directed research projects to give them exposure to the academic research environment. The Bridges program is for two years and starts in the summer. Each summer the students participate in a summer research experience at UMD and are compensated for up to 40 hours a week for 8 weeks. Students also participate in an academic year experience for 15 hours a week, which includes working in a laboratory with a faculty mentor. Students are also encouraged to present their research at a national science meeting, with all travel costs covered by the program. Additionally, each student receives a research supply budget. Must be enrolled full time at FDLTCC or LSC, enrolled in science and/or math courses, and actively pursuing an AA/AS degree, with a minimum of a 2.5 GPA or higher. Must be U.S. citizens or non-citizen nationals or permanent residents. Permanent residents must have a registration card I-551. Deadline for application is April 12, 2019. Students will be notified of our decision by May 3, 2019.